ClearObject CEO John McDonald accepted the Scale-up Company of the Year ($5m-$20m) Mira Award during the 18th annual "best of tech in Indiana" gala. 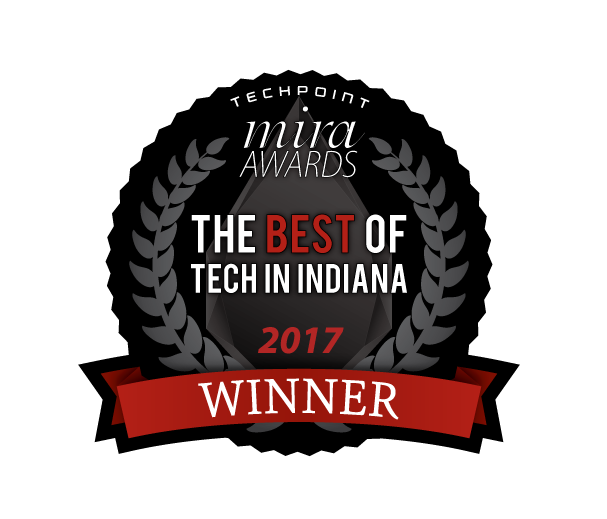 ClearObject, an Internet of things (IoT) innovator and convener, received the Scale-up Company of the Year Award for companies with $5 million to $20 million in revenue during TechPoint’s 18th annual Mira Awards honoring the best of tech in Indiana. The Internet of Things, or IoT, is perhaps the biggest buzz word in tech right now. And while many, many companies claim to be “leading the way” in making sense of this technological advancement, ClearObject is helping its clients bring their actual IoT products and projects to market in the real world. As an IoT innovator, ClearObject applies its years of software-as-a-service (SaaS) and virtual private cloud experience to the table serving as a convenor of knowledge and edge technologies to make IoT work. The Mira Awards judges were impressed by ClearObject’s foresight to capitalize upon the fast-emerging IoT market while continuing to be a leader in providing cloud services to some of the world’s biggest and most well-known brands like Panasonic, Cummins, Whirlpool and McDonald’s. Among all nominees in this category, ClearObject achieved the highest revenue to employee ratio in 2016, and both the company and its CEO John McDonald have established reputations for visionary Internet of Things leadership in a very short period of time. ClearObject has doubled its workforce over the past three years and doubled its revenue every year for the past five years. ClearObject raised $9 million in a Series E venture funding round last year, in part to accelerate is IoT operations as the market grows to more than 8 billion connected “things” and $2 trillion in spending predicted for 2017.